Share market today: Sensex and Nifty on Friday posted their biggest one-day percentage gains since May 2016. Gains in auto, banks, metals, realty, oil and gas sectors, along with a rebound in the rupee as well as global markets lifted market sentiment. 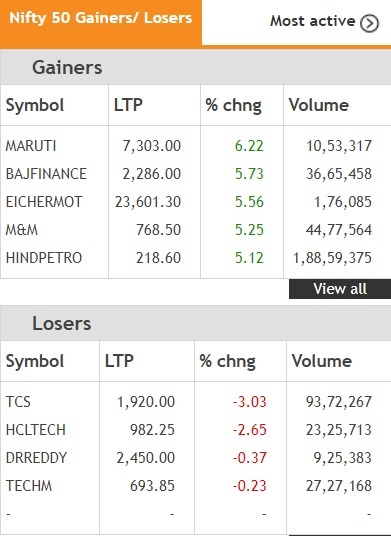 Share market today: Sensex and Nifty on Friday posted their biggest intra-day percentage gain in over two years as market sentiment was lifted by a rebound in the rupee, easing crude oil prices and recovery in the global markets as well. 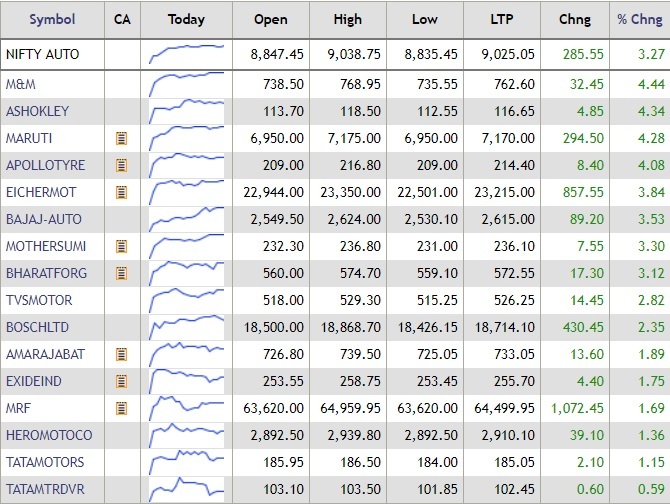 Healthy-buying was witnessed across all sectors — barring the IT index — led by banks, auto, realty, metals and oil and gas. The BSE market breadth was bullish with 2,043 companies advancing against 628 declines. Kolkata-based private sector lender has recieved SEBI exemption with respect to regulatory requirement of a one year lock-in period on promoter shares. According to SEBI rules, promoter shares must be necessarily be locked-in for a period of one year post listing. Bandhan Bank had come out with its public offer in March this year. The shares subsequently listed on the exchanges on March 27th. Leo Puri was appointed as an Independent Director on HUL's Board effective October 12, 2018. The Sensex and Nifty on Friday posted their biggest one-day percentage gains since May 2016. The BSE Sensex closed Friday's trade 732.43 points or 2.15% higher at 34,733.58 points. The NSE Nifty closed at 10,472.50 points, up 237.85 points or 2.32%. With the stock markets remaining highly choppy in the last six months, benchmark outperformers Infosys and TCS have gained the favour of mutual fund managers. Notably, while the Sensex has given negative returns in the last 6 month period, TCS shares have returned more than 32% in since April this year. Mutual funds have raised their stake in the firm. Global shares were having their best day in nearly a month on Friday as European and Asian markets recovered from a brutal selloff that still left them set for their worst week since February, said a Reuters report. After a partial recovery in Asian shares overnight, European stocks opened higher, with the pan-European STOXX 600 up 0.9% on the day. Germany's DAX up 1.1% while Britain's FTSE 100 gained 0.4%. S&P stock futures pointed to a rebound in U.S. stocks later in the day, while the VIX volatility index climbed down from an eight-month high. The MSCI All-Country World index, which tracks shares in 47 countries, was up half a percent on the day. Shares of Allahabad Bank traded 0.81% lower at Rs 97.55 per share on the BSE. 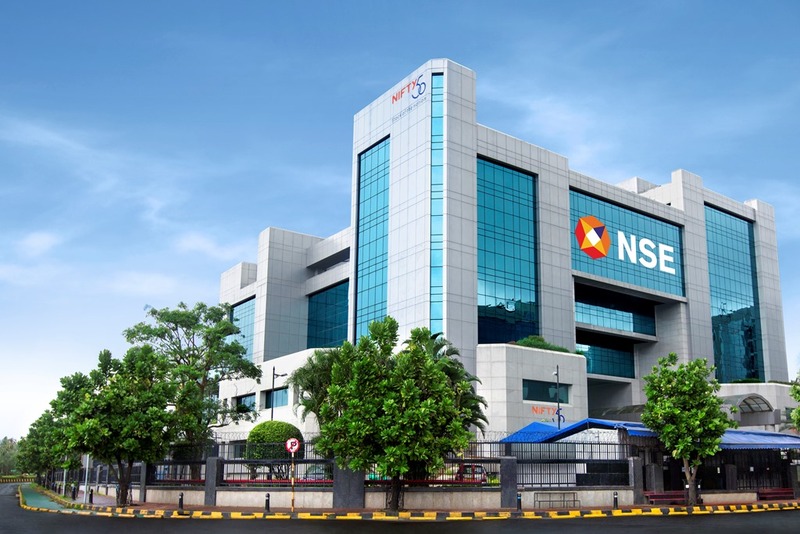 The National Stock Exchange of India Ltd (NSE) on Friday launched the commodity derivatives segment. "To start with, we will focus on key non-agri commodities and gradually broaden our product offerings to agri commodities," the stock exchange said in a statement. To begin with, commodity futures contracts on Gold (1 Kg), Gold Mini (100 gms) and Silver (30 Kg) will be available for trading on the NSE. India's BSE had on October 1, 2018 already commenced trading in gold and silver contracts. BSE Gold Contracts had witnessed a turnover of ₹191.41 Crore in the first week of trading. The BSE Sensex extended gains and jumped over 800 points to an intra-day high of 34,807.22 points intra-day. Most auto, banking, metals and energy stocks led the gains. TCS was the only Sensex loser, which fell nearly 4%. The dollar crept up on Friday, reflecting investor confidence in the U.S. economy, despite criticism by President Donald Trump of the Federal Reserve and a sell-off in U.S. equities, said a Reuters report. Concern about a trade war between the United States and China and expectations interest rates will rise further in coming months have underpinned the dollar's 2.5% rise since July. But a drop in U.S. Treasury bond yields and weaker-than-forecast rise in U.S. consumer prices saw the dollar shed half a percent on Thursday as traders cut their bets on Federal Reserve rate hikes. The dollar index, a gauge of its value against six major currencies, traded flat at 95 on Friday, down from its monthly high of 96.15 on Tuesday. Crude prices jumped 1% on Friday, rebounding after two days of heavy declines with support from robust Chinese crude imports, but oil was still heading for its first weekly drop in five weeks, said a Reuters report. Brent crude futures had risen $1.02 cents, or 1.3%, to $81.28 a barrel by 0637 GMT. The contract dropped 3.4% on Thursday following sharp falls in equity markets and indications that supply concerns have been overblown. Brent is still on course for a 3.4% decline this week, the biggest drop in about four months. U.S. West Texas Intermediate (WTI) crude futures were up 80 cents, or 1.1%, at $71.77 a barrel, after a 3% fall in the previous session. WTI is on track for a 3.5% drop this week. What are the key factors a company raising IPO funds must keep in mind? Dara Kalyaniwala, Vice President, Investment Banking, Prabhudas Lilladher shares key factors that companies must consider while going for an IPO in an exclusive interview with FE Online. Do not think that IPO funds are coming for “free” and that the Company is not answerable. Equity funds are expensive as compared to debt. Raise funds only to the extent required with 5% extra for contingencies. Expect to do the IPO at a fair valuation; do not do an IPO at inflated valuations to extract the last rupee from the investors. Maximum portion of IPO Funds should be used for identified projects or to repay debt or for working capital. Do not raise more than 5-7% of funds even though the present SEBI regulations permit a Company to raise upto 25% for “General Corporate Purposes”; which basically refers to funds being raised for unidentified purposes at the time of the IPO. Appoint a good team of Investment Bank; Legal Advisor and Auditor. Do not cut corners while negotiating fees. Do not appoint an Investment Bank purely on the basis of whoever is giving the highest valuation for the Company. The NSE Nifty rebounded on Friday and rose over 200 points in trade, led by gains in most banking, auto, media, realty and FMCG stocks. 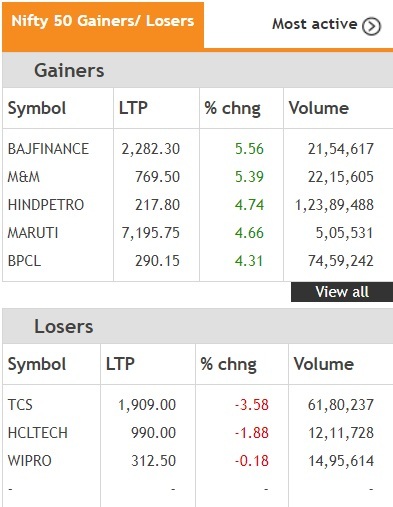 Bajaj Finance led the pack of gainers on the NSE, while TCS, HCL Tech and Wipro were the only losers in Friday's trade deals. Oil and gas stocks continued their gains for the second consecutive day on Friday on lower crude oil prices. Although crude prices rebounded from their two-week lows and jumped 1% on Friday, oil was still headed for its first weekly decline in five weeks said a Reuters report. Reliance Industries gained over 3% during late-morning trade deals. BPCL shares traded over 5% higher. The Nifty Private Bank index traded higher, with shares of Yes Bank rising over 4.18%. 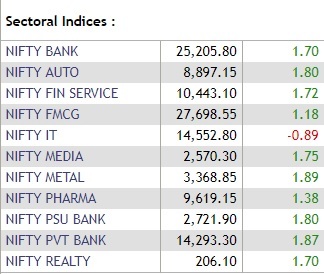 The Nifty Bank index also traded higher by over 2% on the NSE. Meanwhile, The NSE Nifty index was trading 209 points or 2.04% higher at 10,443.65 points. Shares of India’s major private sector lender Yes Bank surged by over 6% during early morning trade on Friday after the firm announced that it has appointed headhunter Kon Ferry to assist in finding CEO Rana Kapoor’s successor. Yes Bank shares zoomed more than 6% to hit an intra-day high of Rs 254.60 per share on the BSE. Bank of Baroda shares gained 4% to an intra-day high of Rs 97.75 on the NSE after the term of MD and CEO S. Jayakumar was extended by one year. Bank of Baroda's Managing Director and Chief Executive Officer P S Jayakumar was Thursday given one-year extension, an order issued by the Personnel Ministry said on Thursday. BoB shares are down nearly 42 % this year as of last close. The rupee gained over 50 paise against the dollar and scaled an intra-day high of 73.5875/$ during mid-morning trade on Friday. At this level, the domestic currency has recovered nearly 90 paise against the American currency from its record low at 74.4825/$. 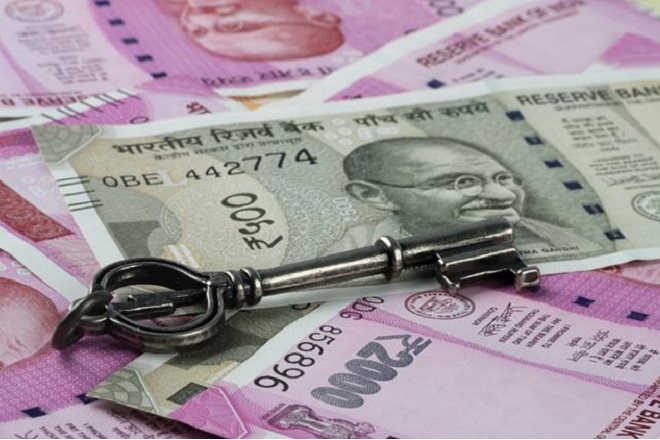 In opening trade, the rupee had recovered 33 paise against the greenback from its previous close at 74.1250 vs the US dollar, Bloomberg data showed. The broader markets joined the upward rally of the headline indices on Friday and gained over 2% during mid-morning trade deals. 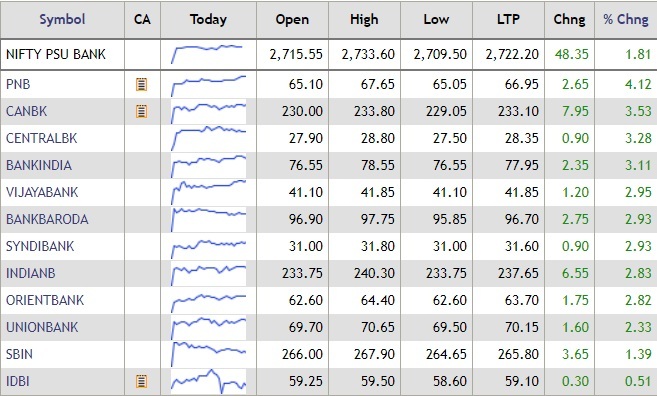 The S&P BSE mid-cap and small-cap i0ndices gained over 2% each. Adani Power led the gains in the mid-cap index, while OnMobile was the top gainer on the BSE small-cap index. The Nifty auto index gained over 3% on Friday, with shares of M&M, Ashok Leyland, Maruti Suzuki and Apollo Tyres gaining over 4% each. 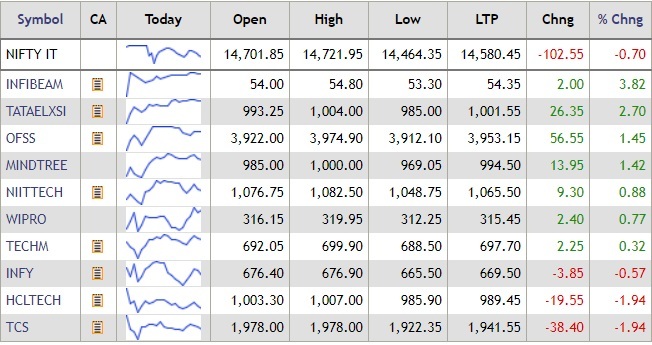 Market sentiment was bullish on Friday, led by gains in auto, banks, realty and metal stocks. Asian shares found a slightly firmer footing on Friday to set course for their first gains in two weeks, but the rout continued in Shanghai where shares hit lows last seen in 2014, said a Reuters report. Investor sentiment was frail though as Wall Street's fear gauge rose to an eight-month high, pointing to more downside risk, market sources said. The biggest market shakeout since February has been blamed on a series of factors, including worries about the impact of a Sino-U.S. trade war, a spike in U.S. bond yields this week and caution ahead of earnings seasons. the report said. MSCI's broadest index of Asia-Pacific shares outside Japan rose 1.3%, led by gains in South Korea and Taiwan. The MSCI index fell 3.6% on Thursday to hit a 1-and-a-1/2 year low. It is on track for a weekly loss of more than 4%. Japan's Nikkei average fell 0.5% while the Shanghai Composite dropped as much as 1.8% to the lowest levels since late 2014, taking losses so far this week to almost 10%. The BSE Sensex soared over 600 points during morning trade deals on Friday led by gains in auto, realty, banks and metal stocks. The Sensex climbed 639 points to an intra-day high of 34,654.79 points. PSU banks stocks gained on Friday as the Indian stock market rebounded from Thursday's lows. Shares of Punjab National Bank gained over 4% during morning trade, followed by Canara Bank, Central Bank, Bank of India and Vijaya Bank. SBI shares traded over 1% higher. HUL share price rose over 2% during early morning trade deals on Friday. The company is expected to declare its corporate results for the second quarter ended September 2018 today. HUL shares 2.48% to an intra-day high of Rs 1,566 on the BSE in early morning trade. The rupee on Friday strengthened 38 paise to 73.74 against the US dollar in early trade in the forex market after global crude prices eased. Besides, dollar-selling by exporters and banks, the greenback's weakness against some currencies overseas, helped the recovery in the domestic currency, said a PTI report. Brent crude fell 3% to trade at 80.37 a barrel in the global market. Forex dealers said a higher opening in the equity market also supported the rupee's sentiment. The local unit, after hitting a record low of 74.50 Thursday, recovered 9 paise to end at 74.12 against the dollar. TCS shares dropped 2.76% to a low of Rs 1,925 on the BSE in early morning trade deals on Friday. IT stocks were mixed on Friday as the rupee recovered against the dollar. TCS had on Thursday reported a 22.6% jump in consolidated net profit at Rs 7,901 crore in the July-September 2018 quarter. The Tata group company saw a revenue growth of 20.7% at Rs 36,854 crore in the September quarter, up from Rs 30,541 crore a year ago. The NSE Nifty opened above the 10,300 level and scaled a high of 10,398.55 points in early morning trade deals on Friday. All the sectoral indices on the NSE were trading with gains barring the IT index. IT stocks slipped as the rupee recovered over 33 paise to 73.7950 against the dollar in opening trade today. The BSE Sensex shrugged off its Friday's losses and jumped over 300 points in opening trade on Friday. The Nifty opened firmly above the 10,300-level. Yes Bank shares climbed nearly 6% in early morning deals, while TCS shares traded lower. While our markets have tumbled over 6% in the month of October, and 16% from the all time highs, there is still hope as the Nifty managed to close above the 10,200 mark at 10,234 after breaking the 10,198 level in intraday trade. While the US markets have tumbled again we believe we may not be impacted much as the Jigsaw puzzle is finally falling into space. The WTI Crude has fallen 3% yesterday. And the Rupee has appreciated after making a bottom yesterday. We expect the Rupee to open around 25 paisa stronger. Crude does not fall in a straight line. It will rise also. But eventually it should move lower. A monthly report from the Organization of the Petroleum Exporting Countries released Thursday, revealed a rise in OPEC and Russian crude-oil production in September, more than making up for a continuing decline in Iranian output ahead of the implementation of U.S. sanctions on Iran’s oil industry. The lingering issue for the markets will be the actions from US president Trump. His remarks on sanctions on India on buying weapons from Russia, progress on trade war with China will keep traders on the tenterhooks. Remain with industry leaders, zero debt and high growth companies. Start an SIP there you will then not be disturbed in case the markets surprise you on the lower side. While we are not out of the woods as yet, I think we are beginning to see semblance of a footpath. Technically we need to ensure that we do not close below the level of 10,140. Yes Bank: Yes Bank has appointed US-based headhunter Korn Ferry to assist an expert panel searching for a successor to outgoing MD and CEO Rana Kapoor. HUL: Hindustan Unilever, Karnataka Bank, and Tata Sponge Iron will declare their second-quarter results today. TCS: Tata Consultancy Services (TCS) reported a double-digit annual rise in its revenue for the September quarter, which it expects to maintain for the rest of the year. RNAM: Reliance Nippon Life Asset Management (RNAM) said it has received mandate from Employees' State Insurance Corporation to manage its funds. GM Breweries: Profit rose to Rs 19.4 crore vs. Rs 15.7 crore; revenue increased to Rs 413.6 crore vs. Rs 384.8 crore (YoY). The BSE Sensex jumped over 250 points in the pre-open session on Friday. The Indian rupee opened 33 paise higher at 73.7950 against the US dollar. Share market on Thursday: The BSE Sensex closed Thursday's trade nearly 760 points lower at 34,001.15 points, while the NSE Nifty ended 225 points lower. Yes Bank was the only gainer on the Nifty bank index. Oil marketing companies gained, while financials, IT, metal stocks dragged the indices lower.